Magna-Power Electronics, a leader in programmable power products worldwide, is proud to announce the delivery of a 1 MW water cooled DC electronic load to the US Navy, which will be used to research, develop, test, and evaluate the operation of energy storage modules (ESMs) in a shipboard environment. To meet this requirement, Magna-Power delivered ten (10) of its standard 100 kW WRx Series MagnaLOAD DC electronic loads, configured in two master-slave sets of 500 kW. 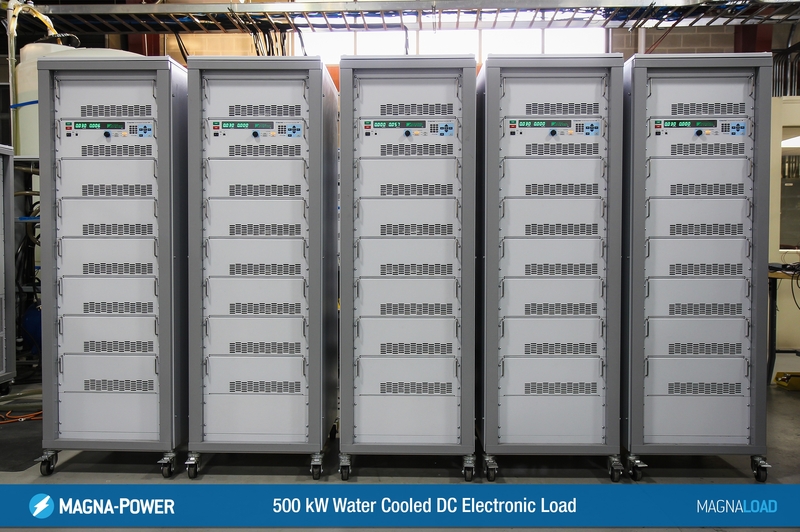 The 500 kW DC electronic load systems will be part of a real-time hardware-in-the-loop (HIL) simulator, which will drive the MagnaLOADs using its high-speed analog input. A digital simulator will be used in place of the actual electric shipboard equipment to conduct model-based simulation of the shipboard electric load. The MagnaLOADs will mimic discharge profile of the ESM, depending on the components under test and the model being simulated. Given the nature of these tests, which can last for days, Magna-Power designed its MagnaLOAD products for continuous full-power operation at 50°C ambient operating temperature and cooling water temperature up to 25°C. Microchannel water cooled heatsinks were designed and are manufactured by Magna-Power, allowing the company deliver power dissipation of 12.5 kW per 4U. In addition, Magna-Power’s new patented Active Resistance Technology (US Patent 9,429,629) combines a switched binary matrix of resistances with MOSFETs to deliver features and performance consistent with traditional electronic loads, at a fraction of the price. The product features a wide operating range, allowing full power to be achieved over the range 50% to 100% rated voltage in its high power range. A separate low power range enables high current operation at lower voltages. This contract was proving ground for Magna-Power’s new distributed DSP digital control platform, MagnaLINK™, which paves the way for the company’s future products. This new control platform, available in the MagnaLOAD product line, provides simultaneous high-speed high-reliability control and measurement aggregation of 40 modules, while operating in a high-EMI environment. Furthermore, MagnaLINK provides simultaneous master-slave firmware upgrade, with new product configuration detection and automatic settings reconfiguration. When fully developed, the ESMs are intended to integrate into the ship’s electrical system and dynamically act as a power source or power sink, depending on the electrical needs of the ship. The MagnaLOAD DC electronic load product line is available now, spanning many air and water cooled models across three (3) product series. Magna-Power designs and manufactures the expansive MagnaDC programmable DC power supplies (1.5 kW to 3,000 kW+) and MagnaLOAD DC electronic loads (1.25 kW to 500 kW+) product lines in the USA to the highest quality standards using robust power conversion topologies. Over 320 MW of Magna-Power products can be found around the world, with continual growth fueled by the company's thousands of models, dedication to quality and robotic manufacturing automation, fast build-times, and worldwide sales and support.